Graduates at the 2018 Raza Resource Centro graduation ceremony. In the Centro there is a Guatemalan flag, which reminds her of her heritage. There is a library and study spaces, surrounded by vibrant murals. But most importantly, there is community—a group that genuinely cares about each other’s wellbeing and success. “Leaving home was difficult; I was the first one to leave without getting married,” said Hernandez, who is the first in her family to pursue a college degree and aims to go to graduate school. Today, Latinx/Chicanx students are among the fastest growing population in California. To advance its goal of inclusive excellence, UC San Diego is launching the Latinx/Chicanx Academic Excellence Initiative. The campuswide program, led by the Office for Equity, Diversity, and Inclusion, unifies and expands services dedicated to attracting and supporting a diverse faculty, staff and student community. An all-campus launch is currently being planned for members of the campus community to learn more about this exciting initiative. The “x” in Latinx/Chicanx transforms the gender-specific terms “Latino” and “Chicano” into more inclusive forms of identity for men, women, non-binary people and those who are gender non-conforming. Latinx recognizes those whose roots stem from Latin America, while Chicanx is an identity rooted in a social justice movement that seeks to empower Mexican American and Latinx communities. In California, 39.1 percent of the population are Latinx—the largest demographic—according to the United States Census Bureau. Moreover, the California Department of Education reports that Latinx/Chicanx students make up nearly 55 percent of all K-12 students. As a university located in a trans-border region, UC San Diego is uniquely positioned to become a top choice for Latinx and Chicanx students—who presently make up 20 percent of the campus’s full-time undergraduate population. The opening of the Raza Resource Centro in 2014. UC San Diego has been recognized as an emerging Hispanic-Serving Institution (HSI), defined as a public university serving a population of at least 15 to 24 percent full-time Latinx/Chicanx students. When the campus reaches the 25 percent threshold and becomes a qualified HSI, UC San Diego will be eligible to receive federal grants to advance its student-centered mission in ways that best serve an inclusive and diverse student body. The new initiative was announced at the UC Chicanx/Latinx Leadership Summit, held Nov. 27-28 in San Diego. Chancellor Khosla and Vice Chancellor Petitt delivered a welcome address at the two-day conference, which was hosted by UC San Diego for faculty, staff and administrators from across the University of California to discuss the systemwide growth of Latinx/Chicanx leadership. The conference was followed by the UC Hispanic-Serving Institutions Retreat on Nov. 29, an event hosted by the UC Office of the President that included conversations about best practices for HSIs as well as advancing equity and faculty diversity. At the heart of the Latinx/Chicanx Academic Excellence Initiative is an acknowledgement that student success is not just about academic success. It is about affirming identity, celebrating culture and recognizing diverse backgrounds—all of which contribute to a positive college experience. UC San Diego has made significant advances in the development and expansion of programs and services to increase Latinx/Chicanx student access and success, from summer transition programs and campus community centers to student success coaches and tailored academic resources. Through programs like the Chancellor’s Associates Scholars Program—55 percent of whose recipients identify as Latinx/Chicanx—more students have access to higher education. Academic success resources, such as the Teaching + Learning Commons, the Office of Academic Support and Instructional Services (OASIS) and the IDEA (Inclusion Diversity Excellence and Achievement) Student Center provide undergraduates with a full suite of tools and services to help ensure their success. In addition, the Office of Student Retention and Success leads numerous programs that foster student achievement and degree completion. 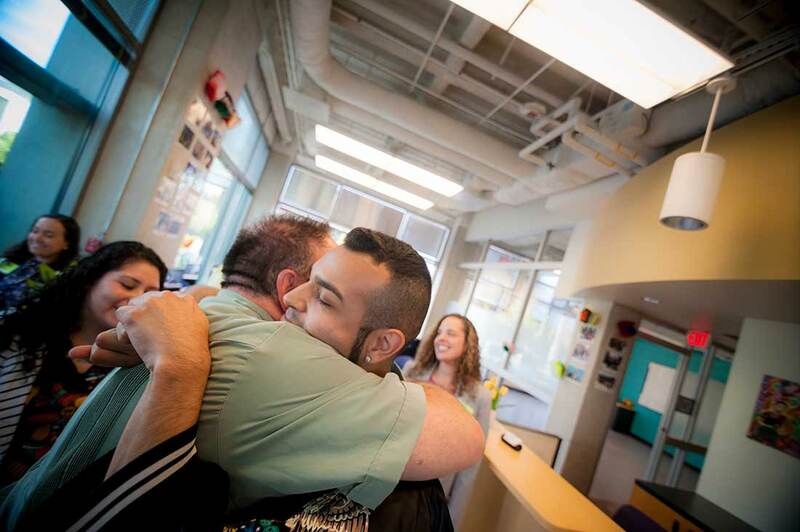 For Brayan Campos, the OASIS Summer Bridge college transition program made an important difference. “I felt like I belonged here. I felt like I could make it here. And because of that, it impacted my academic career here.” Campos was so enthusiastic about the program, they became an Academic Transition Counselor in order to give back to incoming students. 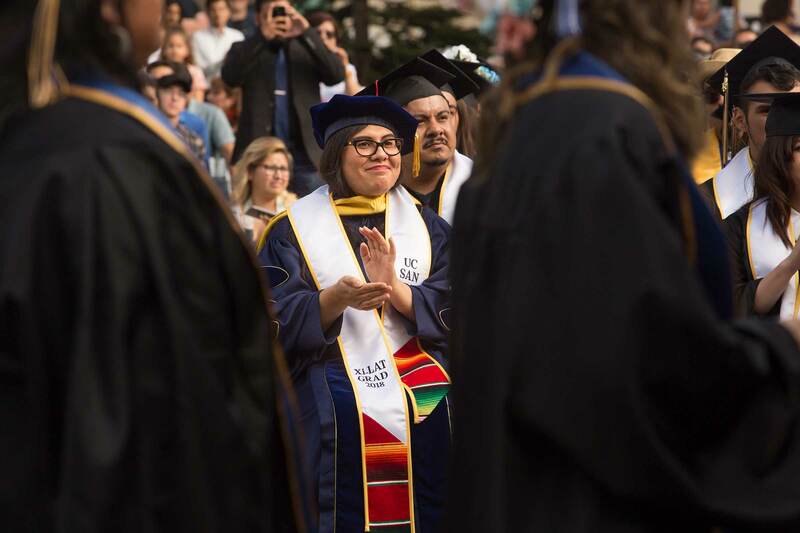 The experience also inspired Campos to pursue a field in either counseling, student affairs or social work so that they could help more underrepresented students achieve higher education. The initiative is part of UC San Diego’s larger Strategic Plan for Inclusive Excellence, a campuswide effort to continue cultivating a learning and working environment where all feel welcomed and valued. Look deeper at how the university is shaping an inclusive future in the Inclusive Excellence Progress Update. 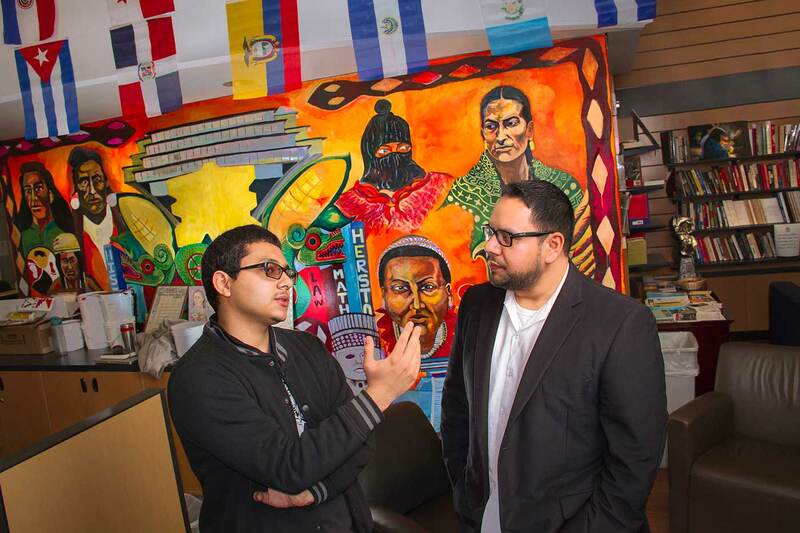 Private support is needed to continue expanding services for our Latinx/Chicanx students. To learn more, contact UC San Diego Development Officer John Duca at (858) 534-8305 or jduca@ucsd.edu.